Equity market falls on the back of profit taking and doubts that the recent rally is not based on solid foundations sent many traders and investors back into the US Dollar resulting in gold trading posting a dramatic reversal of fortunes ending the gold trading session on a wide spread down bar giving us a very strong bearish engulfing signal. This has duly been validated in this morning’s trading where gold trading prices have continued to tumble with spot gold currently trading at the $938 per ounce level and rapidly approaching both the support level and 40 day moving average. 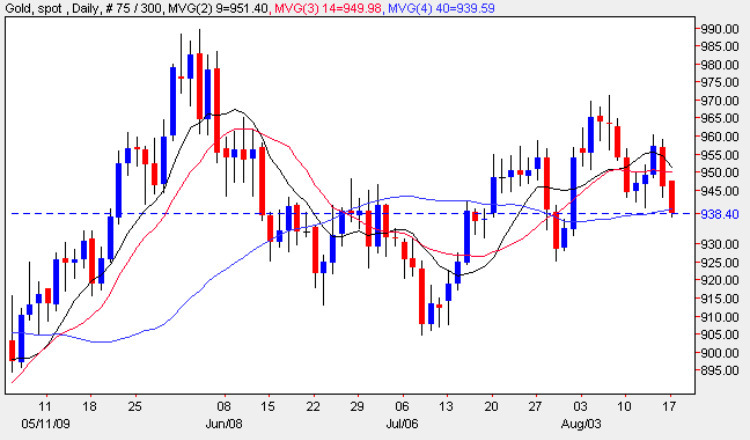 With Friday’s gold trading prices closing below both the 9 and 14 day moving averages the gold chart once again has taken a bearish feel and for the remainder of the week we may well see a move lower given that gold prices have now fallen below the strong support level in place around the $950 price point and look set to fall further and the depth of any fall in spot gold prices will be determined by the extent to which equity markets continue to decline. My trading suggestion is to look for small short trades intra day using the 30 minute chart for suitable entry and exit points. With the recent price volatility in the gold market, this has presented many trading opportunities on both sides of the market, but to be successful you need a specialist gold broker who not only understands the market, but also offers tight spreads, along with the latest news from around the world affecting the commodities sector. One of the keys to success is to practise first, so if you would like a free trial of one of the best gold trading platforms around, then please just follow the link here, and get started trading in gold.